We know there’s no such thing as a complete location-enabled app without navigation. We heard you, so that’s why we went back to the drawing board and built a variety of beautiful UI components for both iOS and Android to give you access to the best in class navigation experiences today. Now, you can build your navigation enhanced apps, without compromising on the quality of the experience you provide while leveraging industry best mobile design principles. The HERE Mobile SDK UI Kit version 2.0 (iOS|Android), tailored for the HERE Mobile SDK, comes with brand new UI navigation components such as the maneuver panel, the actual speed and speed limit information components and the estimated arrival view to create compelling in-app dashboards for turn-by-turn audible and written instructions. Most of these elements are customizable, which means you can introduce any brand colors you want, change any label you need, but more importantly, change the sequence and logic of the UI screens available. 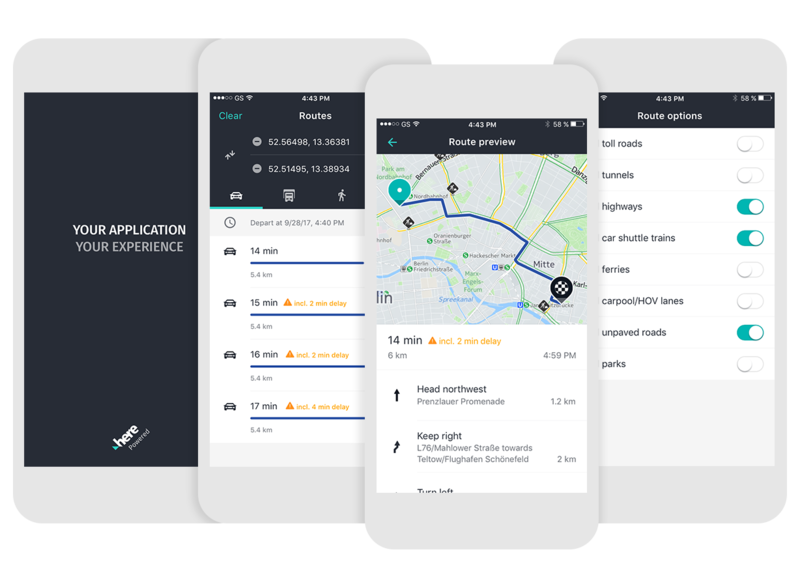 And to assure that all the UI elements available in this kit stay fresh, consistent and always provide the best location experiences, we have also updated the route planer components, previously launched in version 1.0, to improve several usage-related limitations. In addition, we have greatly improved the distribution of the framework from ZIP file and a precompiled version, to a more independent and straight forward way of downloading the ZIP file through GitHub directly (but not precompiled). This switch to GitHub gives you more flexibility to use our code and apply your own customizations to the UI components through the use of the Apache 2.0 license. The HERE Mobile SDK UI Kit framework will be available via CocoaPods for iOS, or via Gradle for Android. So, what are you getting with version 2.0? A variety of brand new UI navigation components, an uplift for the route planer components, a more straight forward open-source distribution platform and an increase in flexibility for customization. Check out the API documentation (iOS|Android) and Quick Start guides (iOS|Android) to get started.